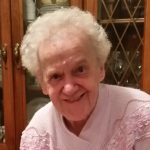 Eleanor Bednar, 92 of Mountain Top and formerly of Wilkes-Barre, passed away Thursday morning, January 24, 2019 at Mountain Top Senior Care with her family at her side. Born in Wilkes-Barre, she was the daughter of the late Felix and Cecilia (Bucknavage) Gawrych. She was the last of her siblings. Eleanor attended James M. Coughlin High School, Wilkes-Barre and was a homemaker all of her life. She was a member of Saints Peter & Paul Church, Plains. She was preceded in death by her husband Edward J. Bednar on February 5, 2007, brothers Felix, Joseph, Edward, and Lewis Gawrych, sisters Marie Werner, Theresa Misczyk, and Josephine Chavanic. Surviving are her son David Bednar and his wife Nancy, Mountain Top, grandsons David Bednar, Mountain Top, Daniel Bednar, Poway, California, and William Bednar and his wife Dani, Murrieta, California, granddaughter Kelly Bednar and her fiancé Matthew Foy, Minneola, Florida, great-grandchildren Daniel Andrew Bednar and Kiley Foy. Eleanor’s family would like to thank the staff at the Wilkes-Barre General Hospital and Mountain Top Senior Care. A Mass of Christian Burial will be held Tuesday, January 29, 2019 at 9:30 am at Saints Peter & Paul Church, 13 Hudson Road, Plains, PA 18705, with Father John C. Lambert, Pastor, officiating. Interment will be held in the parish cemetery, Plains. Family and friends may call Tuesday morning from 8:30 am until the time of mass at church. Arrangements by the Corcoran Funeral Home, Inc., 20 South Main Street, Plains, PA 18705.